I first tried Indian cuisine in 2010 while living in the D.C. metro area. There was this Indian restaurant in Fairfax called Bombay Cafe, and I miss it dearly. 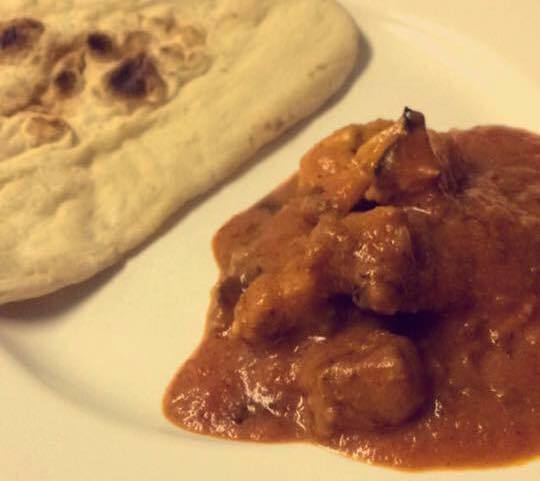 Similar to a lot of westerners, I took to the chicken makhani, also known as butter chicken. A bit after this, I took a trip to India for work, and stayed at a hotel called The Matthan, right off Old Airport Road if you're familiar with the Bangalore area. While staying there for a month I was on a first name basis with the staff, and they know I loved the dish. I'm pretty sure I ordered it every day while I was there. The staff was very friendly, and the makhani was good. So they showed me how they make their version of it, and were even kind enough to let me use the hotel kitchen to cook some for the staff. This was my first introduction and attempt to reproducing the dish myself. Since then (roughly 4 years ago) I've been on an endless mission to perfect my own recipe. You search the depths of the internet and, I can assure you, you will not find a recipe for this that tastes anything close to what you will find in a restaurant. It's a shame, actually. It makes it incredibly difficult for anyone to make top quality makhani at home. I can only imagine the heirloom recipes that aren't making it outside of the family. After years of trial and error, and tasting makhanis both in India and the US, I've finally reached a point with my recipe that I think it's worth sharing. I'd challenge anyone to compare the recipe I'm about to show you to any other that you can find on the internet. Before we dive in, if you unfamiliar, it's a chicken dish with a lovely tomato based gravy, typically eaten with basmati rice or naan. To get started, here is a list of the ingredients you're going to need. If you don't have something, or are unable to get it, don't bother. It's not worth having a subpar makhani. Cut the chicken thigh into bite size pieces, salt and pepper them, and cook in a pan until it's nearly fully cooked. You can use butter or olive oil. Put the chicken (and the juices) into a bowl and set aside. Once the chicken and juices are removed, put the onions and garlic in, and cook until transluscent with some of the butter. Then put in the ginger, half of the coriander, half the chili powder, and the cumin until fragrant. It may get dry, so feel free to add in a bit of water at this point. Next, add in the kasoori methi. I like to somewhat grind it up with the palms of my hands. If you haven't added any water yet, you will probably need to do so now. Add in the tomato sauce. I like to let this simmer for 10 - 15 minutes. Throw in half of the turmeric, and a bit more coriander and chili powder. Simmer a bit longer. Add in our 1/4 cup of heavy cream and let simmer another 10 minutes. Add the chicken and juices, and let simmer for another 15 - 20 minutes. You can add small ammounts of water to adjust the viscosity to your liking. Add in the garam masala. Serve with basmati rice or naan, and enjoy the best chicken makhani you'll ever have. I'm quite confident you'll thoroughly enjoy this, and I recommend that you share it with friend and family. One thing to note, is that the spice amounts may get adjusted a bit, as when I make it I'm doing it entirely to taste.